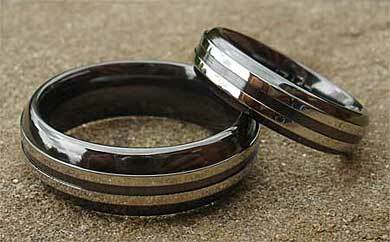 Men's Contemporary Two Tone Wedding Ring : LOVE2HAVE in the UK! 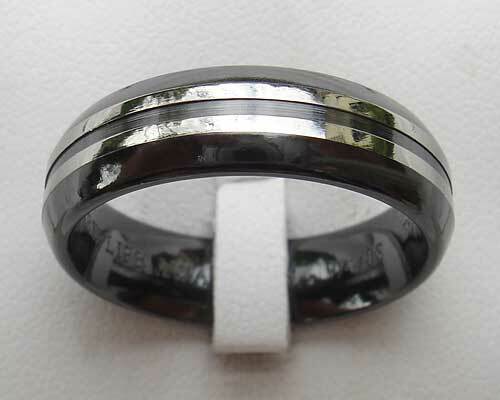 An excellent idea for a men's contemporary two-tone wedding ring, this black zirconium ring has two parallel raised lines in a two-tone detail. 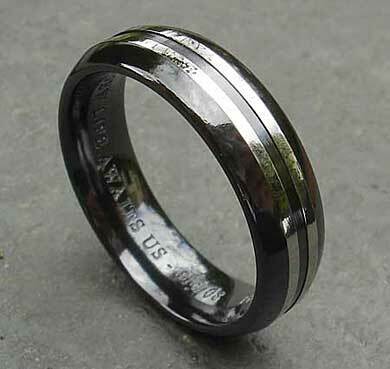 The ring comes engineered as a single piece as the two lines while looking like silver strips, are very subtly raised areas from the black zirconium. The raised lines are also made from zirconium too, and the entire finish is polished, but you can have satin matte if you wish. We prefer the polished by the way as pictured. The ring is machined to a domed profile and measures 7mm wide here, but many other widths are available ranging from 5mm to 12mm. We have them pictured as an excellent set below in a 7mm and a 5mm width. Like all of our titanium and zirconium rings, Z+ sizes are also available on request.